Caribbean with a French flair. : The latest of Ducasse’s challenges (interpreted by Ducasse-trained chef Dagan Lynn and sous-chef Sébastien Rondier) is combining beach food with sophisticated fare served in style right on the beach, or almost. The setting, whether on the terrace just a few feet above the Caribbean waters or in the dining room proper, is a slick design that fuses together with the gorgeous natural décor of the preserved island. The right choice was made to concoct a short menu that allows offerings of fresh preparations, whatever the everyday hardship might be to convey food to this remote location. 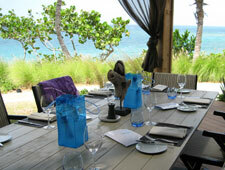 Appetizers as main dishes, although based on standard concepts, have a Caribbean twist. The tuna tartar comes with Malanga chips and the crab and taboulé salad is accompanied by palmitos. Entrees follow suit with coconut rice to accompany the lobster and the miX of pork (pork is the mainstay of Puerto Rico and its islands) is accompanied by pan de maiz (cornmeal bread), a savory moment to pleasantly disorient our taste buds. Pastry chef Steven Rangom --- a Frenchman who hails from the Islands --- signs a happy conclusion with his flavorful and light sorbets and granites. The brief, but well composed wine list offers a choice of French, American and South American bottles.